The list of King Henry IV Part 1 characters provide a convenient introduction to the William Shakespeare play summary of King Henry IV Part 1. The male and female characters bring the plot of the play to life. Not only do we remember the stories but we remember the people - we all have our favourite characters. The following short summary of King Henry IV Part 1 provides a brief description of this famous William Shakespeare play. The story of the plot with its famous characters via the summary of King Henry IV Part 1. Interesting facts and information about the Globe Theatre of Elizabethan London with a William Shakespeare Play Summary of King Henry IV Part 1 with a list of Characters. This drama is one of the great history themed plays by William Shakespeare featuring Sir John Falstaff. Part I is the second in a series of four English history plays. It continues the saga of the Bolingbrook family and the Plantagenet monarchy that begins with Henry IV's seizure of power in Richard II and the coming of age of Prince Henry. The plot moves back and forth between the unhappy court of Henry IV and the vulgar world of the tavern in which Sir John Falstaff presides over his group of rascals where is joined by the fun-loving Prince Hal. The theme of the plot covers rebellion and the struggle for power. Prince Hal and Falstaff join the fighting and Hal kills the rebel Hotspur. 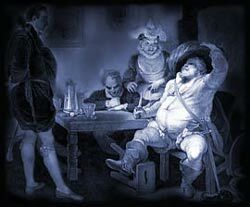 Falstaff feigns death saying, "The better part of valour is discretion; in the which better part, I have saved my life.". The play concludes with King Henry and Hal leaving for Wales to confront the rebels. At the same time, Prince John of Lancaster (John of Gaunt), Hal's younger brother, heads toward York to do battle with rebel forces led by the Earl of Northumberland (Hotspur's father). Interesting Facts and information about the Summary of King Henry IV Part 1 and Characters. Additional details, facts and information about the Globe Theatre and the summary and characters of other William Shakespeare plays can be accessed via the Globe Theatre Sitemap.